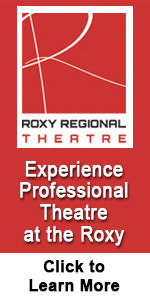 High School Musical: Another Roxy hit! I always brag about the fact that I saw the Roxy Regional Theatre’s performance of Footloose 17 times. It was exhilarating, every single time. Well, I’ve found something that has got that performance beat. It’s the brand new Roxy performance of High School Musical. I attended a dress rehearsal of the show, and I could barely stay in my seat by the end. The show is choreographed by Michael Hartman, and features a long list of local talent from our Clarksville area high schools, along with outstanding performances by the professional actors. It’s a truly wonderful time with singing and dancing. Oh what a theme! It’s okay to be different! It’s okay if you don’t fit in with the “status quo.” I really love it. I had no idea that was the point of the story as I had no interest in watching it on TV. What is also great about this show is that the kids are sincerely having a great time up on stage. They are really into it.